I just got back from my annual Sister Trip with my two sisters. 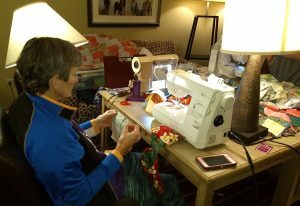 We stayed in a hotel suite so we would have room to set up our sewing machines and have a mini-retreat. We went to Austin and visited seven different quilt shops. We always saved doggie bags from our lunches to eat for supper in our hotel room. So after we got back from our shopping sprees, we would put on our pajamas and get busy sewing and we didn’t have to leave the room again for the evening. Neither of my sisters have quilting machines, so I brought home five quilt tops to be quilted. Four of them are for Charis House. 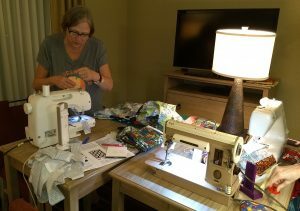 I’m working hard on t-shirt quilts this week because I have a retreat with my quilt bee next week where I’ll be working on more charity quilts as well as a couple of my own.